Around one hundred international guests recently attended a series of open days, product demonstrations and technical workshops hosted jointly by Outline s.r.l. and Cadac in Brescia, near lake Garda in northern Italy. 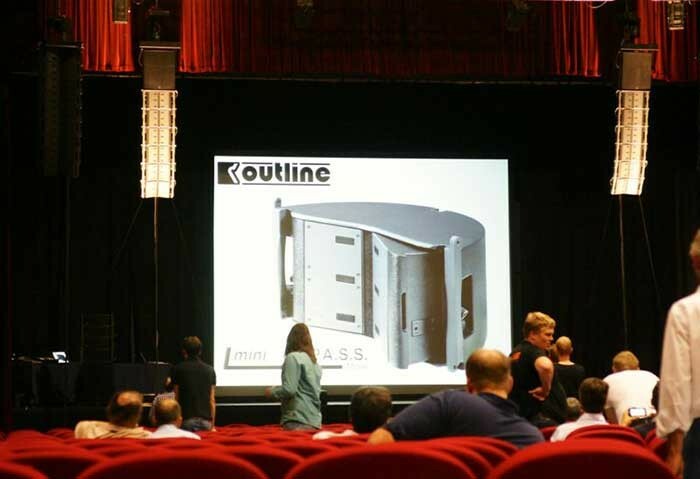 Staged within the beautiful Teatro Palabrescia during the third week in September, the main hall was given over to the complete portfolio of Outline loudspeaker systems. The Eidos 265, Mini-COM.P.A.S.S., Mantas, Spectra, Doppia, DVS and iSM stage monitor ranges were all on operational display, as was the all-new GTO C-12 compact high-power line array system. In the large and ornate foyer area, Cadac presented their Live1 analogue console plus the CDC Four and CDC Eight digital models. Visitors from as far afield as Thailand made the trip to Outline’s hometown, joining guests from the UK, Holland, Germany, Norway, Denmark, Switzerland, Italy, Spain, France, Greece, Canada, Dubai and Singapore. Outline and Cadac national distributors from the UK (CUK), Benelux and Germany (The Audio Specialists), Denmark (Starbaek) and France (Audio²) also sent delegations of staff and invited guests. Each day of the event included three continuous, simultaneous activities - a technical review / core technologies workshop, demonstrations of the various Outline loudspeaker systems and a Cadac product introduction. To accommodate the volume of delegates, smaller groups were created and then rotated around the various locations at 90-minute intervals. The delegates also enjoyed the food, drink and hospitality for which Italy is justly world famous...! The photo gallery is available here. Outline staff in attendance included CEO Giorgio Biffi, directors Michele and Stefano Noselli (sons of the company founder, Guido Noselli), export director Chris Hinds and many others. Giorgio Biffi said: "This is the first time we have ever shared such an important and well-attended event with another manufacturer. We are very happy with our decision to do so because it definitely brought extra excitement, as well as showing us some new presentational ideas that we’ll be developing soon. It was also very exciting to receive so much appreciative feedback from our guests, who obviously enjoyed the occasion very much. Similarly, the Outline distribution partners who attended the event felt that it was a very effective and efficient way of enhancing the profile of our people and products." 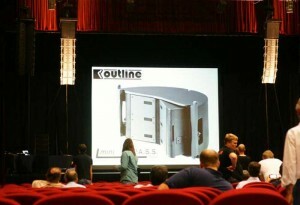 Chris Hinds said: "Although most pro-audio people are perfectly familiar with Outline’s name, not all are aware of the diversity or quality of the products we offer so this event was really about raising awareness. My personal goal for this event was for our guests to leave having realised three things - firstly, that we as a company are highly professional yet friendly and approachable people - secondly, ‘I didn’t realise they did that...’ - and thirdly, that they would consider specifying Outline products for their next project." He concluded: "It’s just part of the process of making prospective clients comfortable with who we are and what we do. Partnering with Cadac, with whom we now share distribution in several key territories, allowed us to widen our invitation list and make even more new friends."